You may wonder how a guy in San Diego goes about testing a heated jacket. While I considered asking local grocery stores if I could hang out in their walk-in freezers, I decided I wasn’t willing to go quite that far in the name of product testing. I saw that MythBusters episode where they drank alcohol and hung out in a walk in freezer to test the theory that hard alcohol can hold off hypothermia. The process (other than the drinking part) looked like it would be pretty uncomfortable, even with a Milwaukee heated jacket. The potential headline for this review, “Slows the Onset of Hypothermia” also did not seem very compelling. Instead, I opted for the Snoopy Test. This rigorous test involved traveling to northern California (where it actually snows!) and visiting the Charles Schulz ice skating rink, also known as Snoopy’s Home Ice. There I stood for what felt like a very long time watching my daughter and sister-in-law ice skating. I deliberately was not skating so I could avoid generating excess body heat that might skew my perception of the jacket’s warmth. Actually, I was not-so-secretly avoiding ice-skating. It turns out ice-skating avoidance is great for testing heated jackets. I basically stood inside a cavernous, very cold uninsulated structure, moved very little, all while in close proximity to a giant block of ice. While many were in full winter expedition gear, not much stood between me and the icy elements other than the M12 jacket. I had both the body and handwarming elements cranking the entire time. This resulted in a fair number of quizzical looks from people (which I interpreted as envy), but it also resulted in me staying quite comfortable. While others were rapidly retreating to the fireside warmth of the “Warm Puppy Cafe” and its various heated beverages, I was able to watch the public spectacle of tail bone bruising, also known as recreational ice skating. Needless to say, the M12 heated jacket passed the rigorous Snoopy test with flying colors, and kept me cozy during several outdoor excursions with far chillier temps than San Diego has to offer. Now that so many colors are in the mix, we’d really like to see a dark blue or green edition. Just kidding Milwuakee! The chances of Milwaukee going with a “Bosch blue”, “Hitachi green”, or even “Rigid orange” are about as high as the elevation in Death Valley. With all the improvements in the new jacket design, we can’t find much to complain about this time around. The only mild complaint is that the battery can be a little tricky to swap out while wearing the jacket. Sure, you could take off the jacket, but who wants to do that when it’s worth wearing a heated jacket to begin with? Shifting the battery pocket slightly forward and angling the top of it forward might make for more ergonomic access. Other than that, this new version is dialed-in. The newer generation of Milwaukee M12 Heated jacket has just about every desirable feature you can dream of, with the exception of a built-in espresso maker (which you can now expect to see in the next generation). With all the various battery and even corded options, you can go from portable power for a few hour outing to a full day+ excursion with XC or 18v options, to indefinite heat with a plug-in accessory. Milwaukee has all the bases covered. 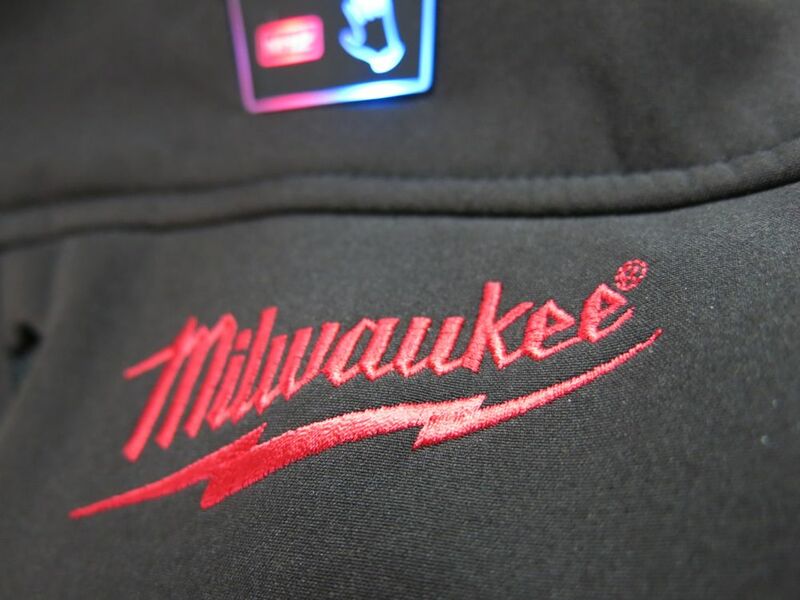 While there’s always room for improvement, we think Milwaukee did an amazing job incorporating all the innovation they did into their latest heated jacket wear. If you like staying warm on the job or at play, we highly recommend you order up one of the latest generation of Milwaukee Heated jackets via the purchase options below. Stay toasty San Diego! Great idea but I wonder how it feels to haul a battery around. Hey Ken. I’ve worn the Milwaukee heated jacket quite a bit and the 12v battery is very unobtrusive. It has a designated pocket that’s on the side/small of your back that does a good job keeping the battery out of the way. This thing is just awesome we had a cold snowy winter this year, and it kept me nice and toasty while snow blowing. I get comments on mine all the time. People are like, “Um, is your jacket glowing?” Me, “Yes it’s heated.” Them “Hey everyone, checkout this jacket, it’s heated.” Anyone who wears it is on the unofficial street team for Milwaukee. Totally. . . it’s Milwaukee’s secret strategy to mobilize a massive undercover sales force. Looks like your jacket even lured in an ice-fishing partner for you. 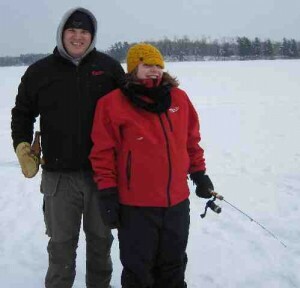 From what I’ve heard about ice fishing, it’s best not a solo activity. Nice work!